This course requires students to post their writing on the public web because our ideas become clearer and more valuable when we share them and receive feedback from others, both inside and outside of our classroom. Although student-created work may be publicly viewable and receive comments on the web, all grades are private and accessible only by the individual student, in accordance with the federal Family Education Rights and Privacy Act (FERPA). If a student desires additional privacy on the public web, s/he may publish work for this course using only a first name, or initials, or a pseudonym in consultation with the instructor. Students will be required to share their work on the public web using some free services such as Google Drive (for documents, spreadsheets, etc.) and the Hypothes.is annotation tool. Students may choose to use their existing accounts or create a new one, and use their full name, or first name, or initials, or a pseudonym in consultation with the instructor. Students will be required to post their final web essays on this public WordPress site. Unless marked otherwise, all content on this site is freely shared by Jack Dougherty and students under a Creative Commons Attribution-NonCommercial-ShareAlike 3.0 license. This means that the author(s) listed in the byline holds the copyright, but content may be freely adapted and redistributed under the same terms, if the original source is cited. 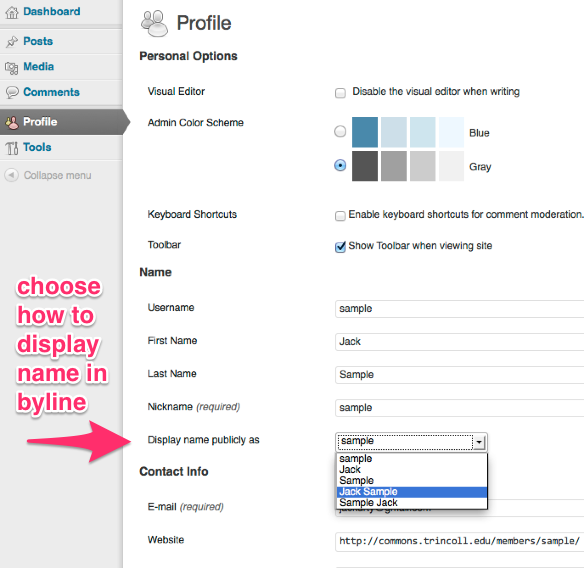 Options to display your name in your byline on WordPress. After an assignment has received a grade, students also have the right to change its visibility (to password-only, or private) or delete it from the site entirely. Students who co-author a post must reach this decision jointly. 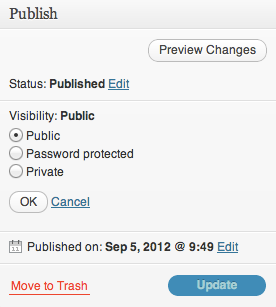 Options for editing visibility in WordPress. In turn, the instructor promises to maintain student posts (or links to posts) until the course is offered again (or longer, if feasible), so that students have the option to link to their work on their resumes or personal websites. Additionally, the instructor will moderate and remove any inappropriate comments on student work on the class site.